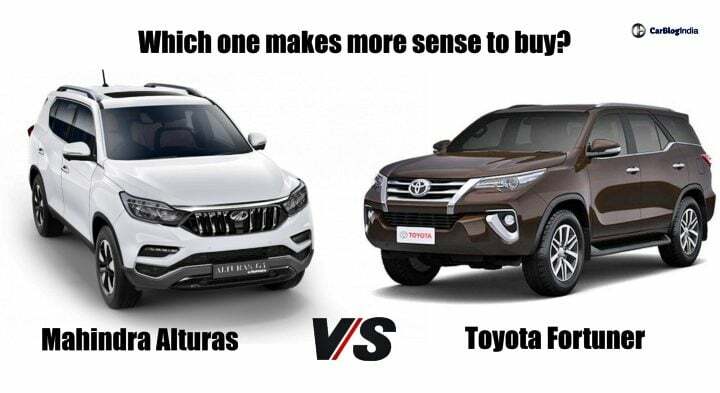 Mahindra Alturas Vs Toyota Fortuner- What’s the difference between the two? We are comparing the Mahindra Alturas vs Toyota Fortuner in order to find out what is the big difference between these two full-sized SUVs! The Mahindra Alturas is based on the G4 SsangYong Rexton and comes to India as a rebadged version of the former. The Toyota Fortuner needs no introduction. It is currently and undoubtedly the segment leader in the full-sized 7-seater premium SUV space. By the looks of it, the Alturas is likely to be priced slightly below the Fortuner. Not only this, but it will also get a considerable amount of features which will surpass the Japanese 4×4. So, with the launch of the Mahindra just around the corner, we pitch this all-new 4×4 against the current segment leader in this detailed specification based comparison report. Read along! Mahindra has already confirmed that the Alturas is going to fall in the segment of 30 lakh plus SUV segment. This SUV will retail in India in a total of two variants. At the time of launch, there will be no petrol derivative on offer. The base G2 variant is going to come with 4×2 drivetrain while the top-spec G4 is going to come with a 4×4 drivetrain. We expect the prices to fall in-between the range of INR 28 lakh to INR 30 lakh. Unlike the Mahindra Alturas, the Toyota Fortuner retails in India in both petrol as well as diesel iterations. The prices of the petrol derivative of this 4x4range from INR 27.27lakh to INR 28.86 lakh. The prices of the diesel derivative of the Fortuner ranges from INR 29.28 lakh to INR 32.97 lakh. This SUV comes with a total of 2 petrol variants. While there are 5 diesel variants on offer. As mentioned before, the Alturas is likely to go on sale in India with just a diesel derivative in its line-up. This engine is likely to be a 2.2-litre unit. It will be capable of churning out 185 BHP of power along with 420 Nm of peak torque. As standard, the transmission responsibilities will be taken care of by a 7-speed automatic gearbox. There will be no manual gearbox on offer. Though it is unlikely if Mahindra decides to launch a petrol derivative of the Alturas, the same is likely to come with a 2.0-litre engine. Coming to the Toyota Fortuner, this SUV retails in India in both petrol as well as diesel derivatives. The diesel derivative is a 2.8-litre unit. This engine is capable of churning out 175 BHP along with 450 Nm of peak torque. The oil-burner is available with a 6-speed manual gearbox. In addition to this, there is a 6-speed torque converter automatic gearbox on offer as well. The petrol derivative in the Toyota Fortuner comes with a 2.7-litre engine. This motor is capable of churning 164 BHP along with 250 Nm of peak torque. It comes with a 5-speed manual gearbox. In addition to this, there is a 6-speed automatic gearbox also on offer. The 4×4 drivetrain is only available on the diesel derivatives of this 4×4. it is still difficult to comment on the mileage numbers of the Mahindra Alturas SUV. This is because Mahindra is yet confirmed about the details of the engine officially. However, considering that this SUV is likely to come with a 2.2-litre diesel engine, it is likely that its mileage figures will stand around the mark of 15 km/l. Coming to the Toyota Fortuner, the diesel derivative of this 4×4 promises to offer 15.04 km/l of mileage. The petrol derivative, on the other hand, promises to offer close to 10 km/l of mileage. However, in real-world conditions, these figures will decrease slightly. As you must be aware, the Alturas SUV is essentially a rebadged version of the G4 SsangYong Rexton. Hence, the exterior dimensions of this SUV are likely to be identical to the latter. Expect the Length of this SUV to measure 4,850 mm, width as 1,960 mm and height as 1,800 mm. This utility vehicle will sport a wheelbase of around 2,865 mm. Coming to the Toyota Fortuner, With the launch of the current generation iteration, this SUV has grown across all proportions. It offers a length of 4,795 mm, a width of 1,855 mm along with a height of 1,835 mm. The wheelbase for this SUV stands at 2,750 mm. While the ground clearance of this SUV stands at 193 mm. Being a premium SUV, the Mahindra Alturas is going to offer a whole array of features and creature comforts onboard. Hope you liked this article. Do let us know in the comment section below if you have any feedback. For more such detailed comparison reviews, keep visiting Car Blog India.